Our last post examined China’s competitive advantage in both augmented and virtual reality, touching briefly on the adoption of immersive marketing by some of the nation’s largest tech companies. We’ve already discussed the many existing and potential applications of virtual reality marketing – now, let’s take a look at how companies are using augmented reality to attract new customers and improve user experiences. Augmented and virtual reality marketing is a form of digital marketing, in that it relies on digital channels to deliver promotional media, more often than not via the internet. Over the past several years, digital marketing’s reputation has been tarnished by obtrusive, non-consensual messaging through tactics like interstitials and prevideos. Young customers, particularly those in the Millennial and Generation Z cohorts, aren’t fans of these approaches, preferring something more organic and experiential. Enter augmented and virtual reality marketing. VR and AR play two different roles in the digital marketing realm: VR is used to create detailed, immersive messaging that help brands connect with their target audience and sells a unique culture or experience; AR is more flexible, scalable, and portable, and is ideally suited to the mobile world. Smartphones are augmented reality’s native platform, meaning just about every customer of every major brand in North America spends a substantial chunk of their day interacting with the one tool they need to experience AR. That makes adoption on a massive scale an almost foregone conclusion; after all, millions of users are already comfortable with AR on social media. Applying Instagram- or Snapchat-style facial filter technology to the surrounding world is the next logical step for AR developers. Indeed, Snapchat introduced World Lenses that let you add AR elements to any scene in April. Now, innovative organizations are experimenting with similar technology. Some airports, for example, are experimenting with AR wayfinding tools and informational overlays, and malls are mapping products to help shoppers easily find what they’re looking for. The fashion industry, already a global leader in virtual reality marketing (check out paragraph nine: https://www.vusionvr.com/will-virtual-reality-fundamentally-change-marketing-industry/) has added AR to its portfolio. Take Burberry as an example: using Apple’s ARKit, the high-end British fashion house developed an augmented reality feature for its existing mobile app that “interacts with users’ camera feeds to digitally redecorate their surroundings with Burberry-inspired drawing by the artist Danny Sangra,” Bloomberg reports. Users can share the enhanced images to social media with a swanky Burberry frame. French cosmetics giant L’Oréal owns several AR apps that let users digitally experiment with thousands of hair and makeup products via their smartphone cameras. The apps, including Makeup Genius and Style My Hair, not only put users in full control of the marketing experience, but also generate mountains of data for the company. As if to emphasize AR’s utility to the fashion world, Vogue UK scored an exclusive interview with Apple CEO Tim Cook to discuss augmented reality’s impending impact on fashion and shopping. Check that out here: http://www.vogue.co.uk/article/exclusive-apple-ceo-tim-cook-future-of-fashion-augmented-reality. You’ll be hard-pressed to find an article about the commercial viability of augmented reality that doesn’t name-drop Pokemon Go, and this one is no exception. Pokemon Go, created by San Francisco-based software development company Niantic, thrust AR into the international spotlight when it became a worldwide phenomenon in late 2016. Brands have naturally tried to capitalize on the obvious popularity of location-based augmented reality games. 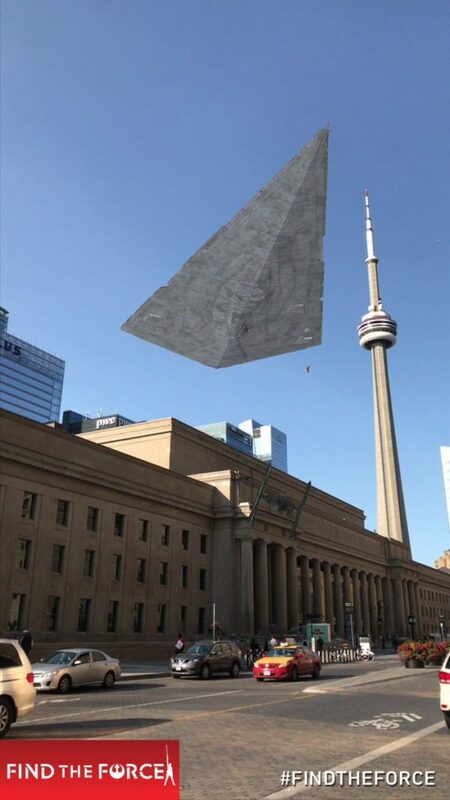 Star Wars’ “Find the Force” campaign, for example, directed fans to international landmarks (including Niagara Falls and the CN Tower, pictured to the right!) to witness characters from its upcoming film in their hometown skies. The Walking Dead debuted an experience that let users find and collect AR zombies. Just weeks after filing for bankruptcy, Toys R Us announced an AR experience intended to drive shoppers offline and into physical locations. Visitors are greeted by the company’s mascot, Geoffrey the giraffe, and ushered around the store by icons and stickers. Kids can scan certain items, which come to life through their mobile device. Despite their differences, augmented and virtual reality marketing is part of a new wave of digital marketing that puts power back in customers hands. Users are no longer content to be bombarded with unwelcome online advertising; they want carefully curated messaging that provides something of value, be it information, an experience, or an opportunity to share with their friends.